In order to achieve success at the organizational level, we need to start management talent development program to create leaders who will help to grow a company, make quick decisions and stay ahead of others. Modern leadership style is no longer applying the traditional model of the “leader-follower”, i.e. one decides and the other executes orders. Nowadays, when most employees are from the category of creative workers and the company is looking for innovation and creative ideas to stay competitive, the leader-leader model is a more effective one, where the leaders’ main goal is to help others to be successful leaders. What is modern Agile management or Agile leadership about? 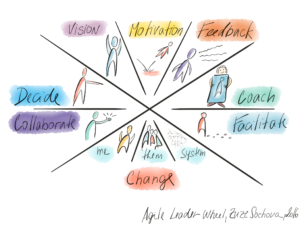 Excellent Agile Leader has four core competencies: Ability to define the vision, motivate, gain feedback, and ability to influence through themselves, others and system. The ability to formulate a vision is the engine of change and motivation. A vision is not necessarily linked to product and business but should be focused on the organization and its purpose. The second competency is the ability to motivate and give the energy. It is a competence closely related to the vision. If you have a good vision, it motivates itself. Agile leadership builds on so-called internal motivation to strengthen the autonomy of individuals and teams. The third of Agile leader’s competences is feedback. Feedback is DNA component for Agile Organization together with openness and transparency. The art of getting system-level feedback is critical for the leader. The last is the art of influencing complex environments. Change things, people and their behavior, support and consolidate culture. Agile leadership begins with a change of self, your judgments, values, and behavior, style of work. Great leaders start with themselves as a role model, to change the way they show up, how they interact with others, and how they can inspire people around them to collaborate, create a team spirit, and become leaders. They are capable of working with the entire system and influence the whole organization and its culture. 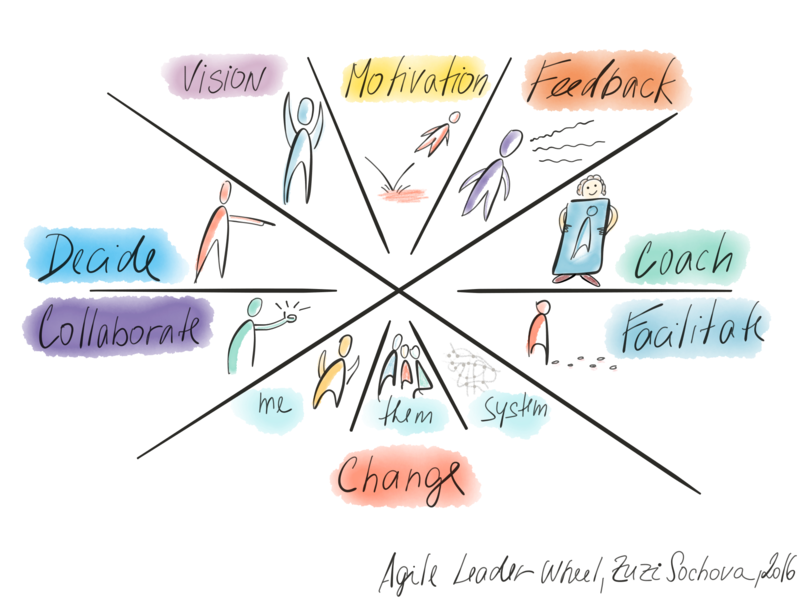 Agile Leader Wheel also defines four supporting competencies to help leaders define the right approach. When is it better to decide and when decisions can be delegated and it’s better to collaborate. At the same time, when it’s better to take a role of facilitator and when start coaching. We do not talk that much about coaching individuals, which of course may be useful, but coaching the whole system – teams and organizations as a whole. 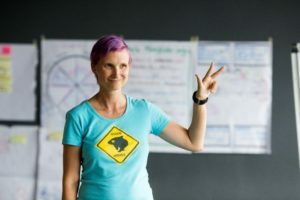 Excellent Agile Leaders have not been born as Agile Leaders, but they are constantly looking for new ways to get better and to gain and strengthen the above-mentioned competencies. The new State of Scrum Survey is out today. Together with some expected statistics, it brought also few interesting points and surprisingly also short success-stories from different industries for example application of Agile at psychological medicine center, Singapore’s Government Technology Agency, and Target. Let’s have a look at Scrum from an executive perspective – executives value the most delivering value to the customer, flexibility, responsiveness, quality, transparency, schedule deadlines, visibility, and team engagement and satisfaction. 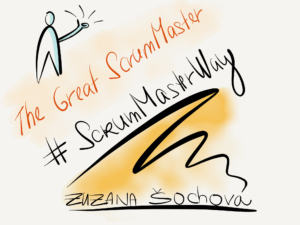 Data shows that 85% people believe that Scrum improves the quality of life. What do you need to consider adopting Scrum? Active senior management and support, alignment with strategic and financial goals of the company, participation of experienced trainers and coaches, and a clear set of business goals to be achieved. Not anything surprising for Agilists, but could be quite eye-opening to companies who see Scrum as only set of practices, roles, and meetings. But Scrum is more than that, right. It changes the whole organizations so it’s not surprising that over 50% of people identified that the biggest obstacle to adopt and scale Scrum is the organizational design and culture.